THE USPTO‘s examiners have been so eager to grant patents and perhaps so out of touch that they granted a patent on podcasting to some parasite, in spite of extensive evidence of prior art (even the Patent Office has acknowledged this by now). As a result, many innocent people with a podcast had been hit (extorted) until the EFF stepped in to help. We last wrote about this earlier in the month and it turns out that after years of disputes the patent troll (which is the patent holder) is still not giving up. Just look what a monumental mess just one single erroneous grant by the USPTO has caused! The podcasting patent became famous and received national media attention after it was used to sue several high-profile podcasters, including Adam Carolla, who raised $500,000 and fought back for a time before reaching a settlement in 2014. Personal Audio had also sued several big TV networks, and its case against CBS went to a jury in September 2014. The jury found the patent valid and awarded Personal Audio $1.3 million, a victory that Personal Audio’s lawyers have noted in their appeal arguments. Despair to who? To patent law firms, i.e. not to actual development powerhouses and/or programmers. 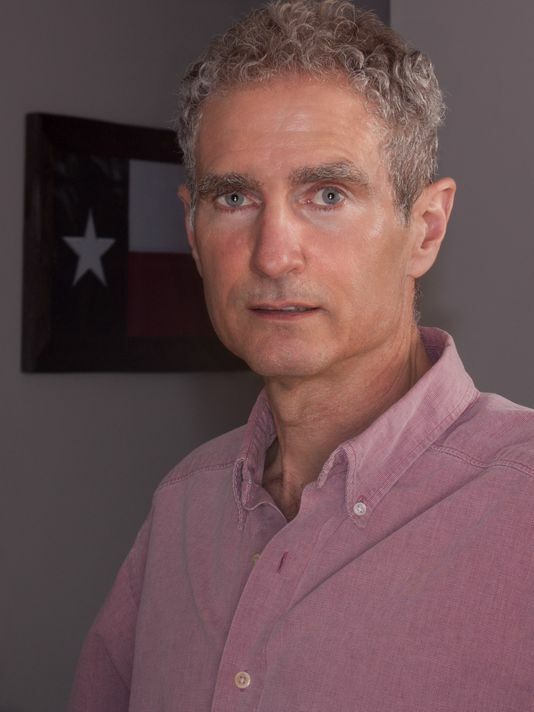 * Wikipedia says the firm, which is a “Texas-based company,” was “formed to enforce two patents applied to podcasting.” It’s described as a “patent holding company” (euphemism for troll). SEVERAL decades ago the Court of Appeals for the Federal Circuit (CAFC) officially brought software patents to the USPTO. Things have been getting a great deal worse since then, as lots of very fundamental programming ideas turned into a monopoly, potentially enforceable against anybody with a computer and low-cost keyboard (and some rudimentary coding skills or access to the Internet, e.g. BBS for source code). In a decision handed down on Friday, August 12, the Federal Circuit decided to hear en banc a case involving a pool-cleaning product owned by Aqua Products, vacating its previous opinion. This is an important case for defenders of the de facto ban on most software patents, especially in light of Alice. As another new article from MIP put it this morning, “The Federal Circuit has issued a rare reversal of the Patent Trial and Appeal Board” (PTAB’s use of common sense reversed in Arendi v Apple). The legitimate concern here is that CAFC, which is not exactly known for integrity (contrariwise, it’s known for mischief and abuse in recent years), will interfere in the operation of PTAB, dominated by scientists rather than lawyers or judges with a law degree and not the faintest clue about programming. Here is another lawyers’ site stating that the “Federal Circuit [is] Going En Banc on IPR Standards for Amending”. 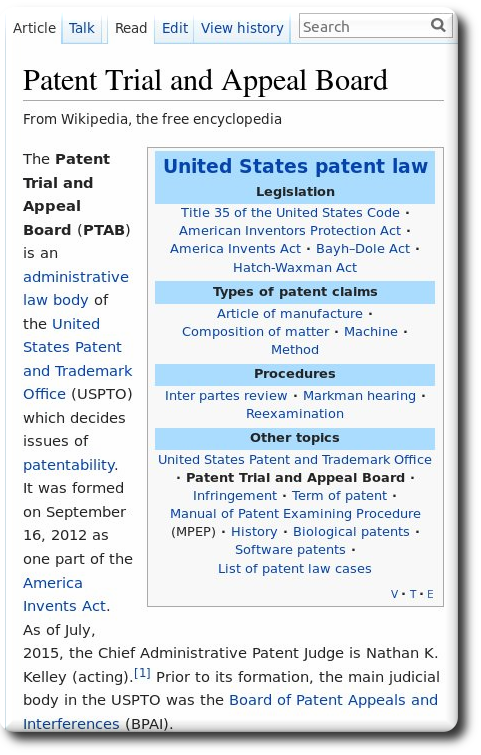 Given that many patent lawyers now equate PTAB with “death squads” (what will they call it next? Stalin? Hitler? ), we’re not terribly surprised to see this kind of bias or patent jingoism. A lot of patents news sites are hard for people to comprehend, probably by design/intention (jargon and reference to sections/cases rather than explicit concepts). This way the patent microcosm can ‘monopolise’ analysis and coverage, eventually misleading the readers and making it seem as though everything is rosy for software patents. 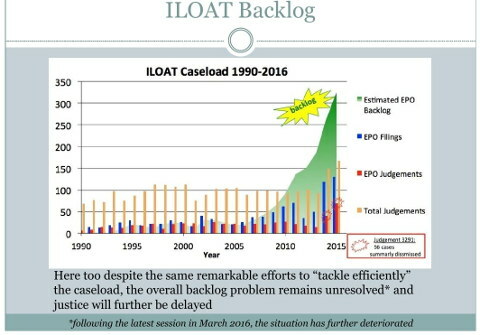 “A lot of people who promote software patents also wrongly equate patents with innovation.”In my personal view, the patent systems per se are not the problem; the problem is patent maximalism and limitless scope, as advocated by those who profit from that (notably patent law firms). They have cheapened/diluted patents/innovation to the point where many patents, once scrutinised in a court of law, simply get discarded. Increasingly, with PTAB around, some or these are discarded before they even reach the court (only after USPTO ‘examiners’ rubberstamp these). Notably, unassertible patents (because these patents are crap and their assignee/owner knows it) are not safe anymore. On the subject of pensions, there is some interesting commentary from the CSC on the latest RFPSS meeting. “The Office thus unnecessarily lowers the probability of reaching our long-term objective for the return on investment, thereby deliberately creating a situation that could be used to trigger further major reforms. The governance in terms of risk monitoring is still unclear through inadequate role clarity, while such governance deficiencies are recognised as often leading to under performance”. If one were inclined to believe in conspiracies, the actions of the Office (including eliminating independent oversight of finances, and seemingly ensuring “underperformance” of the pension reserve fund) could all be interpreted as preparation for an attempt to sequester the approx. EUR7,000 million in the reserve fund. In such a hypothetical conspiracy, the Office would “manufacture” excuses to cut / eliminate pension benefits to those who should be the beneficiaries of the RFPSS fund, only to then conduct a new study that miraculously discovers a massive surplus in that fund. The conspiracy would then conclude with the pension fund surplus being “liberated” by the Office. I have been entertaining similar suspicions since before Mr. Battistelli’s too office, when his immediate predecessor generously spouted expressions like “fit for the future”, “doing nothing is not an option” (in other words: TINA — but what is the problem in the first place?) and imposing the IFRS charade. I would however employ a much stronger word than “sequester”. The questions are IMO: who would be the happy beneficiaries of that heist, how would the loot be split among them, and how would it be transferred out of the EPOrg while maintaining appearances? Don’t forget that there is a French Presidential election campaign coming up in 2017. This is why people who hold elected office for political parties should never be put in change of international organisations with large cash surpluses and no effective oversight. Perhaps we will never know. 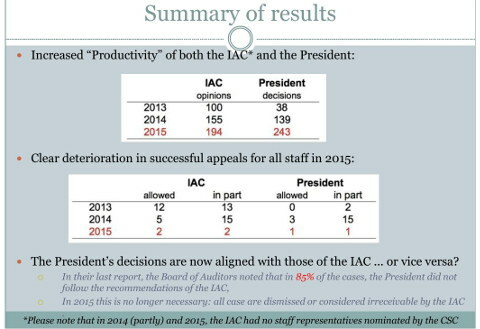 With the full knowledge and approval of the AC, one of BB’s first actions as president was to disband the only body (the Audit Committee) that could have provided transparency / independent oversight in connection with the EPO’s finances. 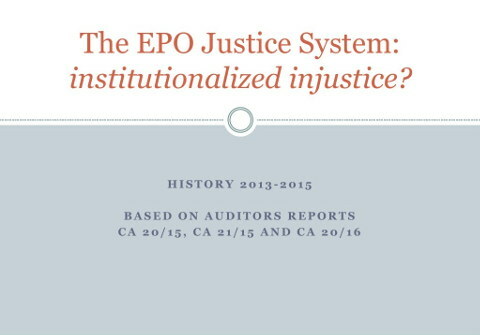 Considering that the facts of the case may be summed up as follows: The complainant challenges the abolition of the Audit Committee of the EPO’s Administrative Council. On 30 June 2011, following a proposal by the President of the European Patent Office, the Administrative Council adopted decision CA/D 4/11 abolishing the Audit Committee, one of its subsidiary bodies, with immediate effect. On 28 September 2011 the complainant, who was then Head of Internal Audit (Principal Directorate 0.6 of the European Patent Office), and Ms H., who chaired the Staff Committee, filed an internal appeal against this decision. They complained, inter alia, that the General Advisory Committee had not been consulted prior to the adoption of the challenged decision. In November 2012 Ms H. withdrew her appeal. Having heard the complainant, the Appeals Committee of the Administrative Council unanimously recommended on 11 December 2012 that his appeal be dismissed, considering, in particular, that the challenged decision had not been taken in breach of any “applicable legal provision”. By a letter of 20 December 2012, which constitutes the impugned decision, the complainant was notified that the Administrative Council had decided to dismiss his appeal. In his complaint filed on 15 March 2013, the complainant asks the Tribunal to quash the impugned decision as well as decision CA/D 4/11 and to order the EPO to submit the initial proposal of the President of the Office to the General Advisory Committee. He also seeks compensation in the amount of 30,000 euros for the moral injury that he considers he has suffered and an award of costs. The EPO submits that the complaint is irreceivable, in particular on the grounds that the complainant is impugning a general decision that does not adversely affect him. In the alternative, it asks the Tribunal to dismiss the complaint as unfounded. 1. The Tribunal has jurisdiction under Article II, paragraph 5, of its Statute to hear complaints alleging “non-observance, in substance or in form, of the terms of appointment of officials and of provisions of the Staff Regulations”. In consequence, when “[t]he complainant does not allege the non-observance of any of the terms of his appointment or of any of the Staff Regulations applicable to him”, his complaint must be held to be irreceivable (see Judgment 2952, under 3). 2. The Tribunal observes that the complainant does not allege any violation of the terms of his appointment or of staff regulations that are applicable to him. His case does not relate to his administrative status but rather to the organisation of the EPO, his employer, for which he is plainly not responsible. The fact cited by the complainant that he was “the principal author of the proposal to establish [the A]udit [C]ommittee” that was subsequently abolished does not grant him any right to intervene in a decision to maintain that subsidiary body or not. The authority to establish or abolish the Audit Committee was vested in the Administrative Council alone, and these decisions did not infringe the complainant’s rights in any way, regardless of his role in the EPO. 3. It ensues from the foregoing that the complaint, which the Tribunal is not competent to hear, is irreceivable and must be dismissed. In witness of this judgment, adopted on 28 April 2016, Mr Claude Rouiller, President of the Tribunal, Mr Patrick Frydman, Judge, and Ms Fatoumata Diakité, Judge, sign below, as do I, Dražen Petrović, Registrar. Delivered in public in Geneva on 6 July 2016. 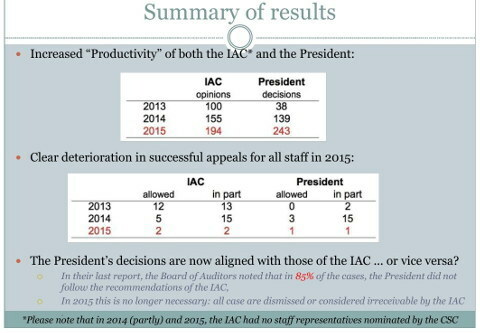 The above relates to our previous post about complicity of the Administrative Council, in this particular case actively removing accountability or oversight from Battistelli, which the Council appears to be in bed with. “COMPLICITY” is increasingly becoming the correct term by which to describe the Administrative Council with its national delegations (who are supposed, at least in principle and in theory, to hold the EPO accountable). Disinterested or self-interested would be a more polite way to put/frame it. If they cared, they would have fired Battistelli already. Even if they kept their word or promise, he would be sacked by now. No secret endowments to this autocrat. “Watch what Erdoğan is doing in Turkey right now (against military generals, judges, journalists etc.) to better understand how Battistellites (Benoît along with his largely French circle) are running the EPO.”Like in most autocratic regimes, control is exerted through fear and the Erdoğan- or Duterte-like Battistelli scares people at all levels, including delegates whom he bullies in plain sight (maybe to make an example). No wonder some top managers are leaving and others, who reportedly (based on rumours) thought about leaving, say the darnest things on TV in order to cover Battistelli's back. Watch what Erdoğan is doing in Turkey right now (against military generals, judges, journalists etc.) 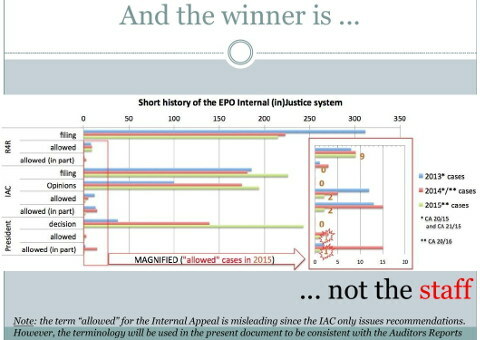 to better understand how Battistellites (Benoît along with his largely French circle) are running the EPO. It’s something to be expected from third-world nations, but it’s happening in Bavaria, traditionally known for class and sophistication. Fear of Battistelli, including fear of firing him (long overdue), is apparent. 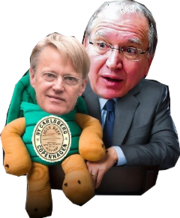 Developments prior the latest Administrative Council meeting suggest that there was not a reversal of their position but rather abstinence from the topic of Battistelli’s abuses (breaking rules, including his own). That’s right. Postponed. 3 months! How convenient for Battistelli, who is no longer so far from his retirement anyway (maybe he will join Sarkozy with his political career thereafter). To quote further: “The circumstances leading to the disciplinary cases against staff representatives and Union Officials have been repeatedly raised with the delegations before and after the confidential Council session. [...] The only mention made in the summary of the C-session was that “the Council resolution will be followed up in one of the next meetings”. 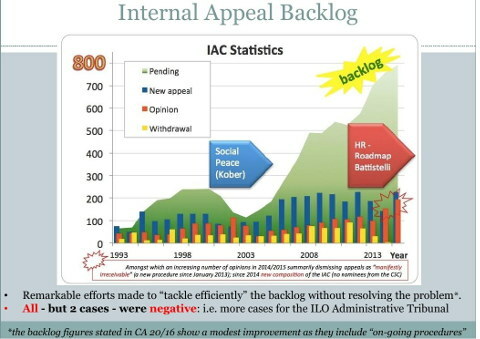 This incredible procrastination shows that the Council is not at all interested in restoring stability to the Office. Put another way, the delegates are complicit; they’re a bunch of obedient cowards, maybe some of them paid for it. * Or just talking to everyone in general, e.g. [1, 2]. If EPO management cannot guarantee justice to its own staff, will it ever guarantee justice to patent holders (defendants and plaintiffs)? Analyst firm Wikibon believes that no vendor is making more than $100 million via OpenStack. If that’s anywhere near true, the sum total of all vendors has to be less than $2 billion. Not being able to sell software unbundled from hardware is a terrible deficit in a world where people are building open servers. In July Redmond informed fans the only way they’d be able to get Azure in their own data centres would be on hardware of its choosing. Specifically, Azure Stack will only come pre-installed on pre-integrated servers from Dell, Hewlett-Packard Enterprise and Lenovo. Other OEMs, we’re promised, will follow. The Dell, HP and Lenovo will come “sometime” in 2017. Azure Stack had been expected by the end of 2016, but the work with to produce integrated systems will mean a delay. As expected, Linus Torvalds made his Sunday announcement for the second RC (Release Candidate) build of the upcoming Linux 4.8 kernel branch, which is now available for public testing. Linux kernel 4.8 entered development last week, when the merge window was officially closed and the first Release Candidate development milestone released to the world. According to Linus Torvalds, the second RC build is here to update more drivers, even more hardware architectures, as well as to fix issues for supported filesystems and add some extra mm work. Responding to a critical need for skilled technology and knowledge workers, the State of West Virginia recently established its first ever coding, app, and game design curriculum for its schools. Starting in the upcoming school year, students will be able to learn the skills required to design, implement, and release their own games, and open source will be pivotal to their development and future. Now that I have finished episode 4 of Life is Strange I felt the overwhelming need to write down some thoughts on it. Note: My copy was provided by Feral Interactive, the porter. Planet Nomads looks like the survival game to really get me interested in the genre, the developers emailed in to let me know that the game is coming to Linux and will release in alpha form this month on the 25th of August. The KDE project announced this past weekend the release of KDE Frameworks 5.25.0, another monthly update to the collection of over 70 add-ons for the Qt5 GUI toolkit and the latest KDE Plasma 5 desktop environment. KDE Frameworks 5.25.0 comes in time for the recently released KDE Plasma 5.7.3 maintenance update of the modern and widely used Linux desktop, promising to update many of the core components, including but not limited to Attica, which now follows HTTP redirects, the Breeze icon set with lots of additions, extra CMake modules, KDE Doxygen tools, KXMLGUI, KWindowSystem, and KWidgetsAddons. KDE apps like KTextEditor, KArchive, and Sonnet received bugfixes and other improvements in the KDE Frameworks 5.25.0. The release also comes with many other updated components, among which Plasma Framework, NetworkManagerQt, KXMLGUI, KCoreAddons, KService, Kross, Solid, Package Framework, KNotification, KItemModels, KIO, KInit, KIconThemes, KHTML, KGlobalAccel, KFileMetaData, and KDeclarative. Chakra GNU/Linux maintainer Neofytos Kolokotronis has been happy to inform the community about the availability of the latest KDE Plasma 5 desktop environment and software applications in the main repositories of the distribution. We bet that Chakra GNU/Linux users have been waiting for this announcement for quite a while now, and the main reason for that is the KDE Plasma 5.7.3 desktop environment, which brings a month’s worth of bug fixes, updated language translations, and improvements to many KDE apps and core components. In addition to the KDE Plasma 5.7.3 desktop environment, Chakra GNU/Linux users can now install some of the latest open-source applications, among which we can mention the Oracle VirtualBox 5.1.2 virtualization software, SQLite 3.13.0 SQL database engine, LibreOffice 5.1.5 office suite, Mozilla Firefox 48.0 web browser, and Wine 1.9.16. So this year was our first GUADEC, for both Aryeom (have a look at Aryeom’s report, in Korean) and I. GUADEC stands for “GNOME Users And Developers European Conference”, so as expected we met a lot of both users and developers of GNOME, the Desktop Environment we have been happily using lately (for a little more than a year now). It took place at the Karlsruhe Institute of Technology in Germany. 4MLinux developer Zbigniew Konojacki informs Softpedia today, August 15, 2016, about the availability of the first public Beta release of the upcoming 4MParted distrolette people can use to partition disk drives independent of a computer OS. Until today, Black Lab Linux 8.0 “Onyx” has been in the Alpha stages of development and received a total of four Alpha builds that have brought multiple updated components and GNU/Linux technologies, but now the Ubuntu-based operating system has entered a much more advanced development state, Beta, and the first one is here exactly six months after the development cycle started. “Today the Black Lab Linux development team is pleased to announce the release of Black Lab Linux 8 ‘Onyx’ Beta 1. Bringing us one step closer to our goal of a stable, secure, and long term supported Linux desktop for the masses. ‘Onyx’ Beta 1 is a culmination of over 6 months of user collaboration and feedback,” says Roberto J. Dohnert, Black Lab Software CEO. Softpedia was informed by the OpenMandriva team about the general availability of the final, production-ready release of the OpenMandriva Lx 3.0 operating system. OpenMandriva Lx 3.0 has been in development for the past four months, as the first Alpha build got released sometime in the third week of April 2016. Since then, the hard working development team behind this open source project have managed to keep up with the latest GNU/Linux technologies and software releases, so that they can bring you an usable and up-to-date computer OS. “OpenMandriva Lx is a cutting edge distribution compiled with LLVM/clang. Combined with the high level of optimization used for both code and linking (by enabling LTO) used in its building, this gives the OpenMandriva desktop an unbelievably crisp response to operations on the KDE Plasma 5 desktop which makes it a pleasure to use,” reads the announcement. OpenMandriva Lx 3.0 was announced Saturday with Linux 4.6.5, Plasma 5.6.5, and systemd 231. An early reviewer said he liked OpenMandriva but Plasma not as much. Elsewhere all anyone can seem to talk about is Google’s decision to use something other than Linux to power its next embedded devices and a TCP vulnerability that could allow remote hijacking of Internet traffic. Patrick Volkerding has upgraded the toolchain in Slackware-current and Red Hat security expert said you can’t trust any networks anywhere. There were a few things I enjoyed about Zenwalk 8.0 and several I did not. Before getting to those, I want to acknowledge that Zenwalk is, in most ways, very much like Slackware. The two distributions are binary compatible and if you like (or dislike) one, you will probably feel the same way about the other. They’re quite closely related with similar benefits and drawbacks. On the positive side of things, I like that Zenwalk trims down the software installed by default. A full installation of Zenwalk requires about two-thirds of the disk space a full installation of Slackware consumes. This is reflected in Zenwalk’s focused “one-app-per-task” approach which I feel makes it easier to find things. Zenwalk requires relatively little memory (a feature it shares with Slackware) and, with PulseAudio’s plugin removed, consumes very few CPU cycles. One more feature I like about this distribution is the fact Zenwalk includes LibreOffice, a feature I missed when running pure Slackware. On the other hand, I ran into a number of problems with Zenwalk. The dependency problems which annoyed me while running Slackware were present in Zenwalk too. To even get a working text editor I needed to have development libraries installed. To make matters worse, the user needs a text editor to enable the package manager to install development libraries. It’s one of those circular problems that require the user to think outside the box (or re-install with all software packages selected). Other issues I had were more personal. For example, I don’t like window transparency or small fonts. These are easy to fix, but it got me off on the wrong foot with Zenwalk. I do want to acknowledge that while my first two days with Zenwalk were mostly spent fixing things, hunting down dependencies and tweaking the desktop to suit my tastes, things got quickly better. By the end of the week I was enjoying Zenwalk’s performance, its light nature and its clean menus. I may have had more issues with Zenwalk than Slackware in the first day or so, but by the end of the week I was enjoying using Zenwalk more for my desktop computing. Patrick is now upgrading basic toolchain in current branch. The basic trio combination (GCC, GLIBC, and Kernel) are normally the first one to update since it will be used as a base for next Slackware release. GCC is now upgraded to 5.4.0, which is the latest version for 5.x branch. Their latest version is at 6.1 while their development version is at 7.0. Getting new people into OSS projects is always a challenge. The Linux kernel is no different and has it’s own set of challenges. This is a follow up and expansion of some of what I talked about at Flock about contributing to the kernel. On August 14, 2016, the Elive development team was proud to announce the release and immediate availability of yet another Beta version of the Elive Linux operating system. Elive 2.7.2 comes only three weeks after the release of the previous Beta build, version 2.7.1, to implement out-of-the-box support for the popular Spotify digital music service, giving users direct access to millions of songs if they have a paid subscription, and a much-improved artwork, as both the system and icon themes were enhanced. Reshaping the classic terminal app to fit multi-form factor world isn’t easy, but it’s the task that the Canonical Design team face as part of their work on Unity 8. Canonical, through Jouni Helminen, announced on August 15, 2016, that they were planning on transforming the community-developed Terminal app into a convergent Linux terminal that’s easy to use on both mobile phones and tablets. Terminal is a core Ubuntu Touch app and the only project to bring you the popular Linux shell on your Ubuntu Phone or Ubuntu Tablet devices. And now, Canonical’s designers are in charge of offering a much more pleasant Linux terminal user experience by making Terminal convergent across all screen formats. Is Fuschsia Google’s answer to Samsung’s Tizen? Will Google replace Android with Fuchsia? Android is one of the most widely used operating systems in the world. But never let it be said that Google is content to rest on past achievements. The company has been hard at work on a new operating system call Fuchsia, and some are wondering if it will eventually replace Android. A team at Google is working on a new operating system called “Fuchsia,” but details are sparse. Fuchsia “is a new open source project that is not at all related to Android or Chrome OS,” said Google spokesperson Joshua Cruz. He declined to provide further details about Fuchsia, saying only that “we have many revolving open source projects at Google.” Fuchsia reportedly already has undergone some testing, and it is booting “reasonably well” on NUCs based on Intel’s Skylake and Broadwell processors. Google has release all the components of the new operating system in a much more permissible MIT license. The community can try it, contribute to it and reuse it. Raspberry Pi 3 users will soon be able to play with Fuchsia, according to Google developer Travis Geiselbrecht, who is working on the project. The source code of Google’s latest operating system has emerged, and it looks like all new code from the ground up. The Fuchsia project can be found here, and uses an entirely new kernel, “Magenta.” It boots on ARM and x86, and the authors say they’ve managed to boot it on a Raspberry Pi. The IPC part is Mojo and higher up the stack is support for Google’s Flutter graphics. Working openly means designing for participation. “Designing for participation” is a way of providing people with insight into your project, which you’ve built from the start to incorporate and act on that insight. Documenting how you intend to make decisions, which communication channels you’ll use, and how people can get in touch with you are the first steps in designing for participation. Other steps include working openly, being transparent, and using technologies that support collaboration and additional ways of inviting participation. In the end, it’s all about providing context: Interested people must be able to get up to speed and start participating in your project, team, or organization as quickly and easily as possible. This conference offers 2 huge days of inspiration, professional development and connecting for those interested in policy, data, open technology, leadership, management and team building. I thought it was a simply login failure, so I logged in and the icon went green, as normal. However, I noticed that Hello did not display the “Start a conversation” window, but one that read “browse this page with a friend”. The FreeBSD Project, through Glen Barber, has had the pleasure of announcing this past weekend the general availability of the first Release Candidate for the upcoming FreeBSD 11.0 operating system, due for release on September 2, 2016. It appears to us that the development cycle of FreeBSD 11.0 was accelerated a bit, as the RC1 milestone is here just one week after the release of the fourth Beta build. Again, the new snapshot is available for 64-bit (amd64), 32-bit (i386), PowerPC (PPC), PowerPC 64-bit (PPC64), SPARC64, AArch64 (ARM64), and ARMv6 hardware architectures. Today we are happy to announce the release of Go 1.7. You can get it from the download page. There are several significant changes in this release: a port for Linux on IBM z Systems (s390x), compiler improvements, the addition of the context package, and support for hierarchical tests and benchmarks. A new compiler back end, based on static single-assignment form (SSA), has been under development for the past year. By representing a program in SSA form, a compiler may perform advanced optimizations more easily. This new back end generates more compact, more efficient code that includes optimizations like bounds check elimination and common subexpression elimination. We observed a 5–35% speedup across our benchmarks. For now, the new backend is only available for the 64-bit x86 platform (“amd64″), but we’re planning to convert more architecture backends to SSA in future releases. Go 1.7 includes a new port to the IBM System z (s390x) architecture, numerous compiler improvements, and more. Compiler work for Go 1.7 includes a new SSA back-end that yields 5~35% speedups on 64-bit x86, a new and more compact export data format, speed increases to the garbage collector, optimizations to the standard library, and more. It’s been a busy year for Windows security. Back in March, Microsoft bulletin MS16-027 addressed a remote code exploit that could grant cybercriminals total control of a PC if users opened “specially crafted media content that is hosted on a website.” Just last month, a problem with secure boot keys caused a minor panic among users. However, new Microsoft patches are still dealing with a flaw discovered in November of last year — it was first Evil Maid and now is back again as Malicious Butler. Previous attempts to slam this door shut have been unsuccessful. Has the Redmond giant finally served up software security? Let’s Encrypt: Why create a free, automated, and open CA? During the summer of 2012, Eric Rescorla and I decided to start a Certificate Authority (CA). A CA acts as a third-party to issue digital certificates, which certify public keys for certificate holders. The free, automated, and open CA we envisioned, which came to be called Let’s Encrypt, has been built and is now one of the larger CAs in the world in terms of issuance volume. Starting a new CA is a lot of work—it’s not a decision to be made lightly. In this article, I’ll explain why we decided to start Let’s Encrypt, and why we decided to build a new CA from scratch. We had a good reason to start building Let’s Encrypt back in 2012. At that time, work on an HTTP/2 specification had started in the Internet Engineering Task Force (IETF), a standards body with a focus on network protocols. The question of whether or not to require encryption (via TLS) for HTTP/2 was hotly debated. My position, shared by my co-workers at Mozilla and many others, was that encryption should be required. After contacted the owner, it turned out that one of the keys is a fake. In addition, labelled same names, emails, and even signatures created by more fake keys. Weeks later, more developers found their fake “mirror” keys on the keyserver, including the PGP Global Directory Verification Key. A data breach at 20 U.S. hotels operated by HEI Hotels & Resorts for Starwood, Marriott, Hyatt and Intercontinental may have divulged payment card data from tens of thousands of food, drink and other transactions, HEI said on Sunday. This week, the Pentagon announced its intention to sell $1.5 billion in armaments, tanks, and military advisory support to Saudi Arabia. If that sounds like a major deal, consider that the United States sold more than $20 billion worth of military equipment and support to the Saudis last year. And this is an alliance that goes back decades. All of that and much more from the United States is put to use in the fierce war that the Saudi military is waging against Shiite militias in Yemen. For instance, the Saudis command U.S.-made fighter jets that drop U.S.-made cluster bombs — a munition that is so imprecise that it has been banned by 119 nations. The U.S. provides targeting assistance, intelligence briefings and even daily aerial jet refueling for the Saudis and their coalition partners, which are mostly other oil-rich Persian Gulf nations. China said it had launched the world’s first quantum satellite on Tuesday, a project Beijing hopes will enable it to build a coveted “hack-proof” communications system with potentially significant military and commercial applications. Xinhua, Beijing’s official news service, said Micius, a 600kg satellite that is nicknamed after an ancient Chinese philosopher, “roared into the dark sky” over the Gobi Desert at 1.40am local time, carried by a Long March-2D rocket. “The satellite’s two-year mission will be to develop “hack-proof” quantum communications allowing users to send messages securely and at speeds faster than light,” Xinhua reported. The Quantum Experiments at Space Scale, or Quess, satellite program is part of an ambitious space programme that has accelerated since Xi Jinping became Communist party chief in late 2012. True to the informal tradition that August brings surprises in Russia, on the 12th it was announced that Vladimir Putin’s chief of staff, Sergei Ivanov, was leaving his position as head of the Presidential Administration (AP) and taking up the new and rather less pivotal job of presidential representative for transport and the environment. In his place, Putin elevated one of Ivanov’s deputies, the essentially-unknown 44-year old Anton Vaino. Whatever Vaino’s strengths, this points to the way Putin is hollowing out his inner elite, surrounding himself with fewer but also less substantial peers, who are unlikely to challenge his worldview and opinions. The State Department has previously deflected questions about coalition attacks by referring reporters to the Saudi government — even though the U.S. has supplied the coalition with billions of dollars of weapons, and has refueled Saudi planes. A British aid worker based in rebel-held East Aleppo says that reported plans by the United States and Russia to conduct joint airstrikes against the city are “ludicrous and diabolical,” and, if carried out, would have a disastrous impact on civilians living there. Tauqir Sharif, 29, speaking to The Intercept from a hospital in Aleppo, says that Russian and Syrian government airstrikes on the city are creating nightmarish conditions for ordinary people. The addition of American forces to the mix would compound the misery of civilians, while giving the impression that the United States was openly siding with the Assad government. The Earth is hotter than ever this year, and so is the debate over climate change. Average temperatures are rising at unexpectedly high rates, so much so that a limit for global warming established by world leaders at a climate summit in Paris in December is now expected to be breached in the next few decades. But though there is abundant evidence for climate change, it still remains one of the most polarizing political issues, as the partisan divide between Americans deepens. Morrissey has accused the British media of victimising those who voted to leave the EU. The 57-year-old singer said he was left “shocked” by the unfair reporting following the outcome of the EU referendum. He claimed those who voted in favour of Brexit were judged as “racist, drunk and irresponsible” yet those who voted to remain were not questioned in the same way. Speaking to Israeli publication Walla! he said: “I am shocked at the refusal of the British media to be fair and accept the people’s final decision just because the result of the referendum did not benefit the establishment. Big investment banks with their European headquarters in London will start the process of moving jobs from the U.K. within weeks of the government triggering Brexit, a faster timeline than their public messages of patience would imply, according to people briefed on the plans being drawn up by four of the biggest firms. There’s a man in the European Union who has already led a country out of the bloc. His name is Uffe Ellemann-Jensen. He’s a former foreign minister of Denmark who handled negotiations on Greenland after its citizens voted to leave the EU in 1982. With a population of just 56,000 and a gross domestic product of about $2.5 billion, Greenland still took three years to exit. Ellemann-Jensen says any notion in Britain that all it needs to do is trigger Article 50 and two years later it will be out is illusory. The drop in the pound caused by the U.K.’s European Union referendum is already affecting manufacturers. Manufacturers’ costs for materials and fuels jumped an annual 4.3 percent in July, the fastest pace in three years. Still, the surge may not worry Bank of England officials yet, since policy makers have indicated they intend to look through any inflation generated by the currency’s slump as they add stimulus to bolster growth. As soon as we voted to Leave the EU, the phrase “post-truth” started to be thrown about a lot more, assisted in part by a certain national embarrassment running for US president. It’s probably fair to say the Leave campaign may have had something to do with this – campaign promises were literally abandoned the morning after the Brexit vote. Just to remind you, here’s what those who campaigned to Leave are really hoping people will shut up about. Larger investment banks with their European headquarters in London are already making plans for their own withdrawal. Many plan to start the process of moving jobs from the U.K. within weeks of the government triggering Brexit, people briefed on the plans of four of the biggest firms told Bloomberg’s Gavin Finch. That suggests the banks may move faster than their public messages of patience would imply, and reflects dismay with the U.K.’s lack of a clear plan to protect its status as a global financial hub. There are concerns British-based banks will lose the right to sell services freely around the European Union. Damage to the economy caused by Brexit will more than offset the modest wage gains for British-born workers in low-paid jobs caused by cutting net migration to the tens of thousands a year, a study has found. A report by the Resolution Foundation thinktank said there would be a small pay increase to native-born employees in sectors such as security and cleaning if there was a big cut in the number of workers arriving in Britain from overseas. But it estimated that these benefits would fail to compensate for the reduction in real incomes caused in the short term by the higher inflation triggered by a falling pound, and in the long term by a slowdown in the economy’s growth rate. Although all too often glossed over, Victorian Britain’s harsh working conditions are no secret. WikiLeaks founder Julian Assange says the Department of Justice (DOJ) set a new standard for its investigations with its probe of Hillary Clinton. “Our D.C. lawyers are delivering a letter tomorrow to Attorney General Loretta Lynch asking her to explain why it is that the now six-year-long national security and criminal investigation being run against WikiLeaks, the reason I have political asylum, has not been closed,” he said on CNN’s “The Lead” on Monday. “Because the DOJ, whose actions seem to be setting a new standard by closing the Hillary Clinton case,” Assange added. “The Hillary Clinton case has only gone for one year. Assange compared the DOJ’s investigation of his organization with the agency’s probe of Clinton, the Democratic presidential nominee. “It was closed under the basis that [FBI Director] James Comey said that they couldn’t establish that there was an intent to damage national security,” he said of the DOJ’s probe of Clinton. “In our case, there’s no allegation that we have done anything except publish information for the public. There’s no demonstrated in-person voter fraud problem in Pennsylvania (or anywhere else, for that matter), and it’s not clear if Trump’s fraud-prevention effort is simply an attempt to collect voter contact information and boost GOP voter enthusiasm, or if it’s actually meant to combat a problem that doesn’t exist. But it’s not surprising that this is a part of Trump’s campaign in one sense: When Trump’s campaign director Paul Manafort was helping to coordinate the campaign effort of a pro-Russia political party in Ukraine in 2006, he used similar tools and rhetoric. Did Trump Campaign Manager Reap Millions in Stolen Ukrainian Wealth? The bromance between Donald Trump and Russian dictator Vladimir Putin—even when reminded of the murders of anti-Putin journalists—has been one of the oddities of the 2016 presidential campaign. Besides Trump’s praise of Putin as a strong leader, and the GOP presidential nominee’s invitation to Russia to hack into the email server of Democratic rival Hillary Clinton, there’s the work done on behalf of a Putin ally by Paul Manafort, Trump’s campaign manager. Donald Trump supporter and Milwaukee Sheriff David Clarke has built a national profile by openly declaring war on the Black Lives Matter movement, from the floor of the Republican National Convention to the pages of national media outlets, once even proclaiming on social media that racial justice protesters will “join forces” with ISIS. The blog platform WordPress blocked or obfuscated public access to the entire recent cache of documents from the account of hacker Guccifer 2.0, including the contact information for Democratic members of Congress and lists of passwords. Guccifer 2.0, the hacker or hackers behind the Democratic National Committee and Democratic Congressional Campaign Committee (DCCC) breach last month, published some of the documents taken from the DCCC system on Friday. While the site only deleted one file — the database of congressional contact information — deleting the post removed all links to other documents in the recent cache. Knowing a direct web address of the files, a user could still download them. The site no longer provides any direction on how to get to those documents. For nearly its entire existence, Twitter has not just tolerated abuse and hate speech, it’s virtually been optimized to accommodate it. With public backlash at an all-time high and growth stagnating, what is the platform that declared itself “the free speech wing of the free speech party” to do? BuzzFeed News talks to the people who’ve been trying to figure this out for a decade. Its commitment to free speech since its very beginning, plus the pressure to grow the number of users, have overshadowed efforts to curtail the abuse on the platform, former employees told BuzzFeed News. Add to that the general internal chaos of a startup. The article echoes some of the well-known criticisms of the internet firm, such as the allegation that it takes better care of celebrities who complain of abuse than it does average people. Twitter has deployed something called the “censoring algorithm” — for example, when it has hosted town halls with famous people such as Caitlyn Jenner — the story said. Perhaps Twitter’s “original sin” was its homogenous leadership team, a former employee told BuzzFeed. White, male leaders didn’t prioritize the abuse problem in part because they were not victimized. In a letter sent to Chesterfield’s School superintendent this month, the National Coalition Against Censorship asked the school system to do away with plans to review several books from a summer reading list some parents voiced concerns over, alleging they are not age appropriate and are objectionable. “Parents have complete control. This was an optional book list. The right response at this point is if parents don’t want their kids reading things, then they tell their kids not to read it,” said Claire Guthrie-Gastanaga with the ACLU of Virginia. The ACLU is part of the coalition and says beyond limiting diversity in education, there are legal troubles with taking books off reading lists. It appears there’s still no shortage of quasi-reputation management efforts being deployed in the form of bogus DMCA takedowns issued by bogus “news” websites. Pissed Consumer uncovered this shady tactic back in April, noting that legitimate-sounding sites like the “Frankfort Herald” and the “Lewisburg Tribune” were issuing takedown notices on complaints posted to the gripe site. These fake news sites tended to be filled with a blend of scraped content and and negative reviews/posts from sites like Pissed Consumer and Ripoff Report copy-pasted in full and backdated to make them appear as if they’d appeared at the bogus sites first. Our article about this tactic, containing some additional details we tracked down, caught the eye of an entity called Web Activism, which is now digging up as many details as it can about this DMCA-abusing reputation management tactic. Web Activism notified Adweek that a couple of past articles hosted there were being targeted by bogus DMCA notices. Who Filed Fake Copyright Infringement Complaints Against AgencySpy? Earlier this year, someone using a fake name, a fake employer and a fake job description filed a fraudulent Digital Millennium Copyright Act (DMCA) takedown request with our parent company’s legal team. Here’s what almost certainly happened: A reputation PR firm had a client who wanted a post written way back in 2010 to disappear from Google’s search results forever, so an employee of this firm copied and pasted our post into a fake news story, backdated it to make the claim more believable, then used a fictional but official-sounding identity to threaten our employer with unspecified legal action. Which Crazy Copyright Holder Took Down Katie Ledecky/Carlos Santana ‘Smooth’ Mashup First? Someone — either the Olympics or whoever holds the copyright to the song — issued a takedown. This is ridiculous. The use here was almost certainly fair use. But when you have two of the most aggressive copyright aggressors around — record labels and the Olympics — I guess it’s no surprise that they would ignore fair use and take down content like this, which is the kind of content that would likely only get more people interested in either the Olympics or the music. But, no, copyright is apparently more important than that. Online auction raises question: Have NSA’s hackers been hacked? Last week, both Symantec and Kaspersky released a series of reports on a nation-state malware attacker dubbed alternately “Strider” or “Sauron.” Although neither formally attributes the attack to any particular country, reading between the lines it is pretty clear: The U.S. was Here. Attributing malcode is always questionable, and there is some possibility this is not the (rather excellent) work of the NSA but instead some the efforts of a FVEY ally. But—given the quality, the modular nature, target selection, and lots of other details—the smart money is on this being from our friends at Fort Meade. If we assume that it is, what does this mean? WikiLeaks uploaded on Monday 186 megabytes of what it says is apparently archived malicious software linked to the US National Security Agency (NSA). MOSCOW (Sputnik) — WikiLeaks is an international non-profit journalistic organization founded in 2006 to disseminate documents, photos and video of political or social significance, according to the organization’s Facebook page. A Quebec man who refused to give his smartphone password to border officials at Halifax Stanfield International Airport last year has pleaded guilty and been fined $500. Alain Philippon, of Ste-Anne-des-Plaines, Que., had said he would fight the charge of hindering or obstructing border officials, but changed course Monday morning when his lawyer entered a guilty plea on his behalf in provincial court in Dartmouth, N.S. Maid agencies in Malaysia are stunned by a “new” directive imposed by the Immigration Department barring them from hiring non-Muslim maids. Employers have questioned the rationale behind the policy, which department officials said was not new, as they were worried that they may not get any maids at all. Malaysian Maid Employers Association (MAMA) president Engku Ahmad Fauzi said the policy would limit the supply of maids for Muslims. “Religion should not be an obstacle. When you work in an office, you don’t base it on religion and likewise, this should not be the case for the maid in the home,” he said on Sunday (Aug 14). Police in Helsinki are criminally charging drivers caught working for the smartphone-based chauffeur service Uber. Previously, drivers found behind the wheel of an Uber only faced a misdemeanor fine. For all the professionalism that has overwhelmed the Olympics, the games are supposed to be conducted with a spirit of sporting fraternity. And officials reacted sternly after a member of the Egyptian judo team refused to shake hands with the Israeli athlete who had just defeated him. The International Olympic Committee said Islam El Shehaby received a “severe reprimand” for his behaviour following his first-round heavyweight bout loss to Or Sasson last Friday. While I don’t doubt that some officers believe footage may assist them in justifying shootings, there’s very little here that suggests anything more than a statistical blip. No such increase was noted in 2013 or 2014, and a 3.64% increase would seem to be a fluctuation, rather than anything correlative. The authors of the study note one issue that may be skewing the numbers slightly upward: there’s very little data available to differentiate between justified shootings and unjustified shootings. Without this, it’s difficult to draw the conclusion that officers have made conscious or unconscious decisions about the perceived exculpatory value of capturing deadly force incidents on tape. And yet, such a conclusion is being tentatively drawn. A new study by Temple University researchers, however, suggests that the wearable video cameras may not lead to fewer police shootings of civilians, but may actually make officers more likely to use lethal force. The shooting and riots have put a spotlight on what has been called the worst place to be black in America, a city so segregated and divided from its suburbs that an old racist joke claims the city’s 16th Street viaduct bridge is the longest in the world because it links “Africa to Europe.” Milwaukee’s population of 600,000 is roughly 60% black and Latino, with a poverty rate of over 30%, dilapidated infrastructure, and little or no access to decent jobs; its suburbs are rich, up to 96% white and staunchly Republican – and Gov. Scott Walker is blamed for long working to keep it that way. iDefend, composed of Human Rights Defenders, has come out with a public statement and organised the candle lighting as a form of protest to #StopTheKillings on 15th August 2016, Monday at Tomas Morato cor. Timog Cirlce and Welcome Rotonda in Quezon City. As you’ve heard ad nauseam, Apple appears extremely likely to remove the headphone jack from its next iPhone. This hasn’t gone over well! Apart from forcing some people to buy new wired (or wireless) headphones, it’s likely to raise the cost of the average headphone, and make many learn to live with dongles. Still, there are some potential benefits to adopting a digital audio connection like Lightning — noise-cancelling could become standard, for instance, and higher-end Lightning cans could provide better sound. Plus, if Apple makes jack-less iPhones the norm, it’d at least do so in one fell swoop. Lightning replaces 3.5mm, and that’s that. AbbVie v Amgen: Is the “patent dance” fair for both sides? The suit is the first filed under the Biologics Price Competition and Innovation Act (BPCIA) in which two parties have disagreed upon which patents should be in dispute, and raises a question about the efficacy of the “patent dance” process established by the BPCIA. We discuss trademark disputes centering on the beer and alcohol industry around here because that particular industry is finding itself at something of a barrier centered on how brews are named. Still, one story from a couple of years ago was particularly head-scratching. That story was that of Schlafly beer, made by Tom Schlafly’s St. Louis brewery, and the opposition to his trademark application from his aunt and cousin, Phyllis and Bruce Schlafly repsectively. Both family members filed oppositions to the trademark application, claiming that having their last name associated with an alcoholic product would negatively impact them. Bruce is an orthopedic surgeon, making one wonder exactly how bone-shattering Schlafly beer actually is. Phyllis, meanwhile, is a super-conservative commentator with an audience particularly cultivated amongst Mormons and Baptists, therefore an alcohol product with her surname on it would be ultra negative for her commentating business. For many years, while some journalists (and newspaper execs) have been insisting that a paywall is “the answer” for the declining news business, we’ve been pointing out how fundamentally stupid paywalls are for the news. Without going into all of the arguments again, the short version is this: the business of newspapers has never really been “the news business” (no matter how much they insist otherwise). It’s always been the community and attention business. And in the past they were able to command such attention and build a community around news because they didn’t have much competition. But the competitive landscape for community and attention has changed (massively) thanks to the internet. And putting up a paywall makes it worse. In most cases, it’s limiting the ability of these newspapers to build communities or get attention, and actively pushing people away. And, yes, sure, people will point to the NY Times, the Wall Street Journal and the Financial Times as proof that “paywalls work.” But earth to basically every other publication: you’re not one of those publications. The paywalls there only work because of the unique content they have, and even then they don’t work as well as most people think. Not surprisingly, more and more newspapers that bet on paywalls are discovering that they don’t really work that well and were a waste of time and effort — and may have driven away even more readers. On Friday, the 4th Circuit Court of Appeals rejected efforts by Kim Dotcom to regain control over millions of dollars in assets seized by the US Government. By remaining outside the US, the court found that the Megaupload founder is a fugitive from justice. But Dotcom isn’t ready to give in and will take his case all the way to the Supreme Court if necessary.